Culms: Mostly erect, slender, stiff, strongly triangular, pilose; base reddish. Leaves: Blades to 6 per culm, green, 1 to 12 inches long, .06 to .16 inch wide, flat, margins revolute, surfaces pilose. Sheaths: Long, tight, densely pilose. 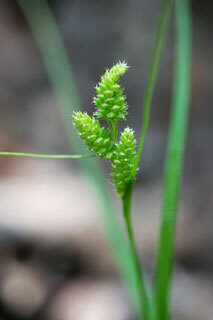 Inflorescences: Terminal spike erect, usually on short peduncle, thick cylindric, .4 to 1 inch tall, .14 to .24 inch, containing both staminate and pistillate flowers, pistillate at top; lateral spikes 2-4, erect to ascending, densely clustered, .3 to .7 inch tall, .12 to .2 inch wide; pistillate scales greenish white with green midrib, ovate, .07 to .1 inch, apex obtuse to acuminate, occasionally mucronate, shorter than perigynia; staminate scales greenish white with green midrib, ovate to lanceolate, .08 to .2 inch, apex acuminate; perigynia 15-30 per spike, ascending, obovoid, bluntly triangular, .08 to .12 inch, glabrous; beak absent. Fruits: Achenes, triangular with concave sides, .07 to .1 inch, apiculate; stigmas 3. Habitat: Woods, meadows, roadsides; dry, open, disturbed sites.